ORLANDO, FL (October 14, 2015) – Harbor House of Central Florida (HHCFL), Orange County’s only state-certified domestic violence organization, officially broke ground today on a new 119-bed emergency housing facility named the Morgan & Morgan Home – A Safe Haven for Families. The organization also announced replication plans of the facility for other domestic abuse shelters around the world; and launched the public phase of the capital campaign to finish the building. Last year, Harbor House reached more than 15,000 domestic abuse survivors through its outreach services. The current shelter includes 102 beds, but has averaged 147 temporarily living on the campus, nightly, over the past year. 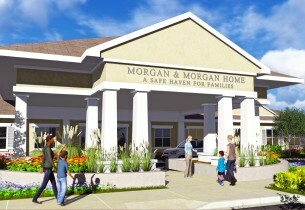 The Morgan & Morgan Home – A Safe Haven for Families was designed to balance two distinct needs: the survivors’ psychological needs for a warm, healing, home-like environment; and a cost-effective facility that can be built and maintained efficiently without feeling cold or institutional. The new emergency home is 27,500 square-feet and will house up to 136 parents and children in 20 bedrooms. Each bedroom will have built-in bunk beds with stairs and will sleep six people because of the bunk beds’ unique trundle design. Every survivor will have their own bed behind a locked bedroom door, allowing for the privacy and dignity anyone would require to heal. The new home also includes four private bedrooms, which Orlando Health helped to design, to meet the special needs of moms with newborns. These rooms will also meet the special needs of guests with disabilities; and provide a private living space when men with children seek safety. Harbor House estimates that approximately 60,000 people experience an abusive relationship across Central Florida each year. Of that, at least 2,000 survivors are homeless due to domestic violence and are in danger of losing their lives. Half of those survivors are children, with the majority being under the age of five. The average stay for a family in Harbor House’s short-term emergency housing is 70 to 80 days. Harbor House’s new emergency home was also designed based on standards established by The Bill & Melinda Gates Foundation, which funded research by the Washington State Coalition against Domestic Violence to determine best practices for short-term housing for domestic abuse survivors. Harbor House is one of the first domestic abuse organizations in the country using the standards from this research and are the only who will share the design to save other organizations the cost of designing their own centers. Harbor House’s new emergency home was provided preliminary designs at no cost by Rhodes+Brito Architects and Westgate Resorts. VOA Architects and Collage Companies have taken the project further; and both have waived their rights to any additional design fees for organizations around the world. This, in turn, will save each organization $220,000. Orange County, the largest donor for the project, has contributed nearly $2 million; Morgan & Morgan contributed $1 million to have their name on the new home; and the City of Orlando has contributed nearly $750,000. Government funding came through Community Development Block Grants. Today, Harbor House also launched the public phase of the capital campaign to raise nearly $3 million to finish the building. The total cost of the project is $7.4 million, which covers everything, including a facility endowment with yearly proceeds to maintain each donor’s investment. As of today, Harbor House has raised 64 percent, or $4.7 million. To make a donation towards the project or for more information about Harbor House of Central Florida, visit www.harborhousefl.com. If you or anyone you know might be experiencing domestic abuse, call the 24-hour crisis hotline at (407) 886-2856 or 800-500-1119 (Florida). Harbor House is Orange County’s only state-certified domestic violence center. It provides safe shelter, a 24-hour crisis hotline, counseling, legal advocacy and justice for thousands of domestic violence survivors and their children each year. Harbor House works to prevent and eliminate domestic abuse in Central Florida by providing critical life-saving services to survivors, implementing and advancing best practices, and educating and engaging the community in a united front. For more information, please visit www.harborhousefl.com. Follow the organization on social media through Facebook at Harbor House of Central Florida; Twitter @HarborHouseFL; and YouTube at harborhousefl.